I wanted to try my hand at clustering and was looking through the scale bible Rockets of the World for a good rocket to model. After looking over the same old rockets again, I discovered something new. Perhaps it's new to the third edition or perhaps I'd just missed it before. The OTRAG was post-WWII West Germany's only solo rocket venture and it was ultimately unsuccessful. However, it was a very unusual looking rocket and would make a great model for clustering with its main body of four tubes. After some quick calculations, I decided to model the OTRAG at 28%, which would give me a forward and aft end of about 9" (matching tubing made by Maximum Thrust Rocketry) and propellant tank tubes of about 3" (matching commonly available tubing). That's four 76mm motor mount tubes. Now we're talking! See the history section below for more information and pictures. The drawing on the right and all historical information on this page is from Rockets of the World, third edition, by Peter Alway. 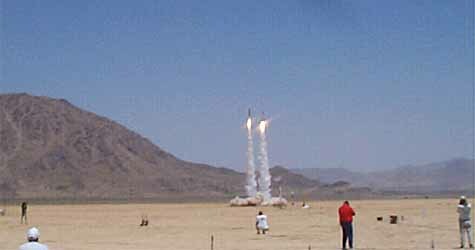 The OTRAG flew first as part of the "M event" at ROC-stock XI on June 11, 2000. 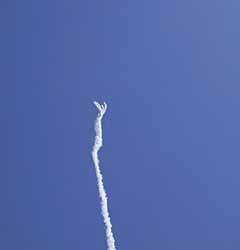 This drag race between five level three rockets took place on Sunday morning, minutes before noon. I finished the OTRAG so late that I didn't get any pictures of it at home! 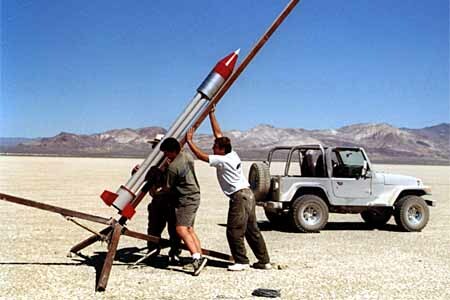 This picture, out at the launch, was the first time the rocket was completely assembled! There's always a rush to finish rockets before the next launch, and rain on Wednesday and Thursday didn't help matters. At any rate, the OTRAG was completed and I managed to get it to the launch with all its components and hardware and ready to fly. Here are the parts for the four K560s which it flew on. I built these motors up on Saturday evening so that I'd be ready for Sunday morning. Even with all that preparation ahead of time, prepping a rocket this complex is always a scramble at the end. Finishing the rocket and setting up the launch pad was more than I could do. Thanks to Troy Stacey and the other fine ROC members for all their help! As always, the launch is so much of a pleasure because of the people. I didn't manage to get a good shot of the launch, but several other people did. Below is a very nice sequence of shots by David Smith. Above: Big Purple and the OTRAG neck-and-neck. Probably Big Purple wins the drag race, but it's definitely a photo finish. Above right: Five big smoke trails from the rockets. Now that's a drag race! 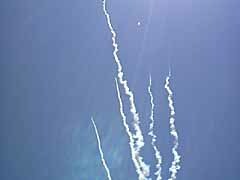 Right: There was so much smoke on the ground that the rockets which took off more slowly were enveloped. Wedge Oldham took this video of the M event. It's very large (15.5Mb) so you may want to download it to your machine before playing it. Big Purple is on the very left and the OTRAG is the second from the left. John Van Norman also took video of the launch. This one is also large (8.6Mb). 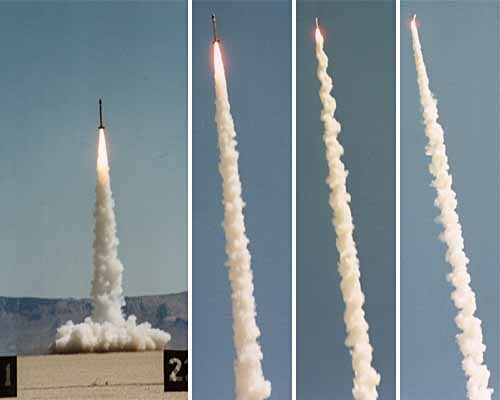 The shot on the right was taken by Pete Heckman and shows Big Purple and the OTRAG well enough that you can actually see what the rockets look like! The OTRAG was recovered without damage; no fins broken or sheard off! This was much better than expected and means I still have two spare fins for the next flight. 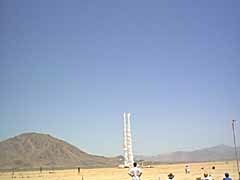 There was no wind at all and even though the rocket came down from 6700 feet on dual parachutes, it was only a short drive from the launch rail. 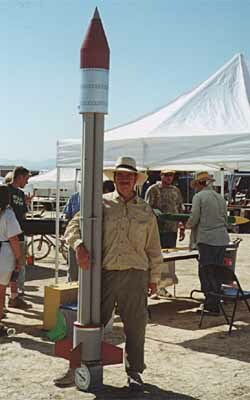 The OTRAG flew next at the AERO-PAC Mudrock 7.0 launch on June 25, 2000. This time, on four M1315s! The four motors made the rocket too heavy for our scale, so I had to weight it dry then add in the weight of the four motors. (You can see the four motors on the lower right.) These four pictures are by Ranny Mitchell. Below you can see me loading the first of the motors into the OTRAG while it was laying down. I ended up loading and unloading the motors several times as the rocket was first too heavy to weigh and then too heavy to carry easily. The four motors lit simultaneously and the rocket rose into the air on a beautiful plume of fire and smoke. 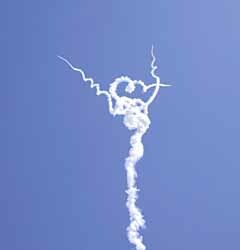 Things looked perfect until about 2½ seconds into the flight where instability developed and then the rocket shredded spectacularly. The four motors broke off and went in four directions, burning for at least another second. Peter Luthi took a great video of the flight and made these AVIs of the whole flight and of just the shred. Tony Morkevich also got a great video with some good audio too. If you look closely at the videos or the photo sequence below you can see oscillations, probably due to fin flutter, in the smoke trail. Max Q wins again! The picture on the right is immediately before the rocket came apart; you can see it tilted over, probably as it's starting to break apart. Below you can see two shots from Adam Gervais' great photo sequence showing the start and full bloom of the shred. Of course, there wasn't much left of the rocket after this violent an end. However, I did manage to salvage the two parachutes and all four motor cases. The electronics seem to be undamaged as well. 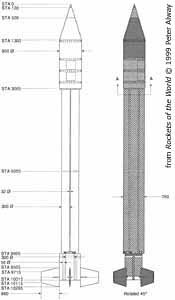 From the drawings in Rockets of the World, you can see that the rocket is not totally symmetrical. (The vertical view on the right.) However, for simplicity I decided to model it as a simpler symmetric rocket. 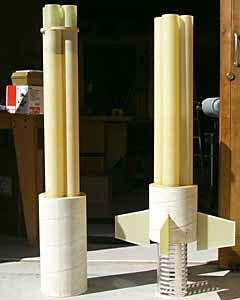 Since I'd already chosen the 9" and 3" body tubes based on the scale (or rather, the scale based on these tubes), the only real design work was to determine how the rocket would be constructed. See my model drawing for actual size and the centering ring drawing for the tube layout. Giant Leap Rocketry is now selling Hawk Mountain fiberglass tubes and I decided to take this as an opportunity to try them out. Giant Leap is my favorite supplier as they have done much custom work for me and Ed is a great person to deal with. Since the fins stick out behind the rocket, they will probably not survive a rough landing. In order to be able to fly more than once, I decided to bolt the fins in so they can be replaced if they break. To do this, custom aluminum supports are used inside the fin can. See the drawing. In late May, I finally received all the components. This has been my most complex rocket so far, with many custom pieces built by four different suppliers. 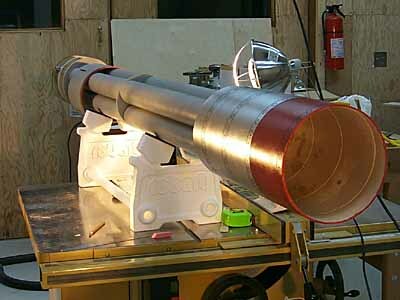 The white body tubes came from Maximum Thrust Rocketry, the centering rings, fins and fiberglass tubes from Giant Leap Rocketry, the metal fin supports from Schaefer Sheet Metal and the turned nose cone from San Francisco Wood Turning. Not shown is various hardware and smaller parts. This is a complex rocket! The first thing to assemble was the fin can. Because the fins stick below the aft end of the rocket, they will be in great danger during landing. Because of this, I needed to make them break-away and replaceable. 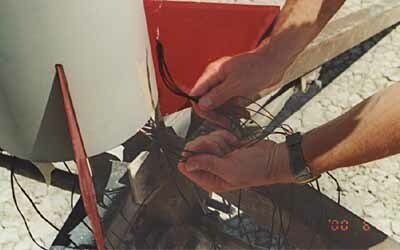 To do this, the fins bolt into aluminum fin supports with nylon screws. Hopefully, the nylon screws will break before the 0.125 G10 fins do. If not, the fins can be replaced. Below you can see the fin can with the fin supports installed and a close-up of one fin support and fin. With just a few days until ROC-stock (June 9, 2000), construction began to get frantic. I had planned this rocket for so long, and had so many delays in getting the various parts, that it all ended up in a rush at the end. (Of course, it often ends up that way anyway.) Below you can see a shot of the two major sub-assemblies ready for joining into the body of the rocket. The aft end of this rocket looks pretty mean too. 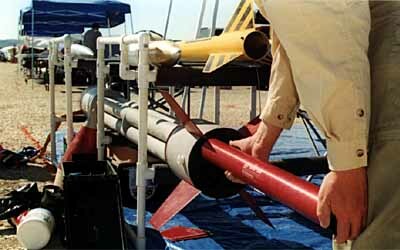 In the shot below, you can see the four motor mount tubes and the way the fins bolt into the fin supports. Those heat lamps are to keep it warm in the shop as the day has been cold and now it's raining (on June 7, 2000)! You can also see how the rear airframe section slides down over the fin slots to cover the fin can for flight. After World War II, most of Germany's stellar rocket talent moved to America to work for the Army, and eventually NASA. The technological line of the V-2 continued in America, the Soviet Union, and France, but the divided Germany made no great national effort in rocketry. Germans limited their efforts to small military missiles and contributions to larger European projects, including Europa and Ariane. But in the 1970's a group of West Germans formed a company to privately create a revolutionary inexpensive space rocket: OTRAG. In the 1960's Lutz Kaiser, a student of rocket pioneer Eugen Sanger, experimented with minuscule liquid propellant engines. Along with Wolfgang Piltz (a rocket pioneer best known for transferring German rocket technology to France in the post-war period), Kaiser and Sanger developed plans for a minimum-cost space rocket. 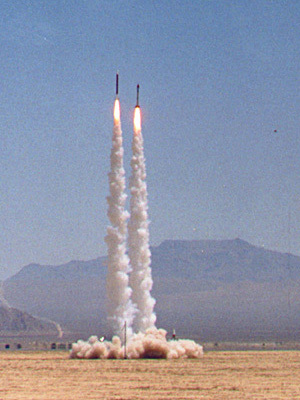 In 1971, Kaiser received German government funding to study such a rocket. Funding was cut off in 1974, so Kaiser founded Orbital Transport-und Raketen Aktiengessellschaft (Orbital Transport and Rocket Corporation, or OTRAG) to continue the work with the backing of 600 investors. 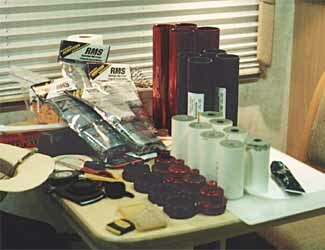 OTRAG's objective was to build an inexpensive satellite launch booster as simply as possible. The propellants, diesel oil and nitric acid, were chosen for cost and ease of handling. 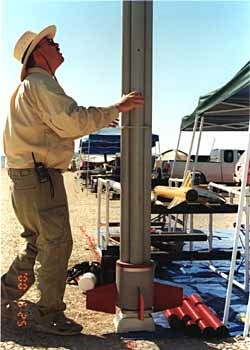 The rocket would be made of small, simple modules, using off-the-shelf commercial components where possible. Each module consisted of a tank and an engine (adjacent modules would share fuel and oxidizer). 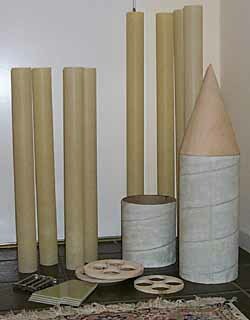 Propellant tanks would be standard industrial tubing, about 30 cm (1 ft) in diameter. Valves were selected from chemical industry catalogs and operated by standard windshield-wiper motors. In order to eliminate complex turbopumps, the engines were pressure-fed. Control would be provided by throttling the engines independently. Modules would be clustered together to form rockets of practically any size. 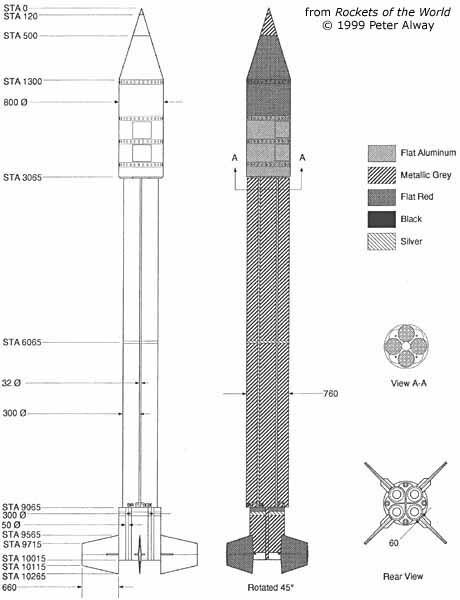 OTRAG planned rockets ranging in performance from "Scout Class" (launching 200 kg (440 lb) into a 300 km (186 mi) orbit) to "Titan Class" (10,000 kg (22,000 lb) to 300 km (186 mi) orbit). Stages would be nested within each other. 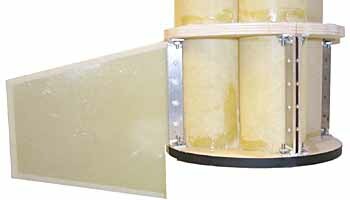 At staging, the inner portion would slip out from the expended outer shell on rollers. The "Delta Class" booster would be a bundle of 60 modules, including a 6-module third stage nestled in an 18-module second stage, nested, in turn, in a 36-module first stage shell. Aerospace professionals were divided over the practicability of the OTRAG scheme. 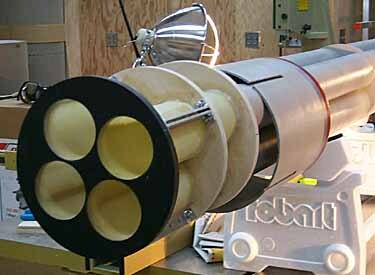 Some criticized the selection of propellants and the pressure feed system as unworkable, while others pointed out that the cheap propellants and materials of the rocket would bring huge weight penalties, which, in turn, would make more modules necessary, wiping out the cost and complexity advantage of the system. 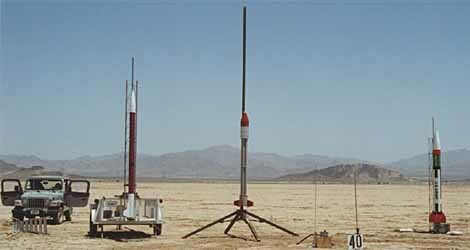 OTRAG tested the concept with a minimum cluster rocket, OTRAG-1. 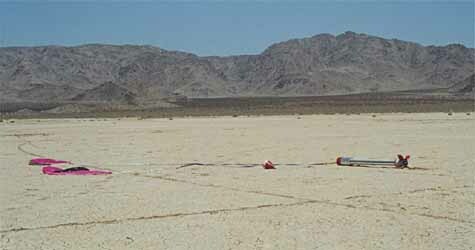 The test rocket consisted of four propulsion modules, a nose cone, and four fins. A success could show that the OTRAG approach had at least a reasonable chance of working. OTRAG-1 took off from a sparsely populated region of Zaire on May 17, 1977. All four engines performed well, boosting the bundle of tubes to an altitude of 20 km (12 miles). All was not well. By the end of the year, reports surfaced that OTRAG was a cover for a secret German weapons program. OTRAG's connection with Zaire was also suspect. Kaiser's professed willingness to launch reconnaissance and other "politically sensitive" satellites for all comers did not help matters. Test flights continued, including a repeat of the first flight. When a larger rocket was tested in June of 1978, it flew wildly off course within seconds of leaving the pad. 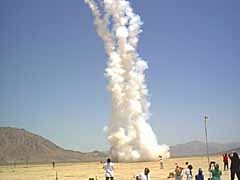 It failed to reach its intended 100 km (62 mile) altitude. Soon OTRAG was kicked out of Zaire, and forced to set up shop in Libya. After tests in 1980, Libya proved to be no more politically safe than Angola. Final tests took place at Essrange at Kiruna, Sweden in 1983. Eventually political and technical difficulties took their toll, and OTRAG ceased operations in 1987. After the fall of OTRAG, German space rocketry has been limited to cooperative international programs. But the re-unified Germany has taken tentative steps in the direction of a 2-stage space plane, similar to single-stage vehicle proposed by Eugen Sanger in the 1940's.